Turkish cuisine is very rich, but finding a really Turkish gourmet meal is not easy. Balikçi Sabahattin, Istanbul top fish restaurant, is located in a beautiful ottoman house in the historical district Sultanahmed, and is no longer off the beaten track. 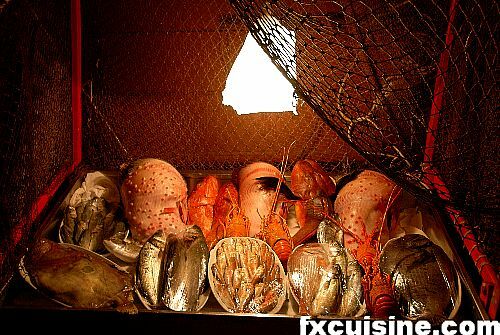 But despite the large number of affluent tourists, the food suffers no compromises. I visited twice and was so impressed by their simple concept. 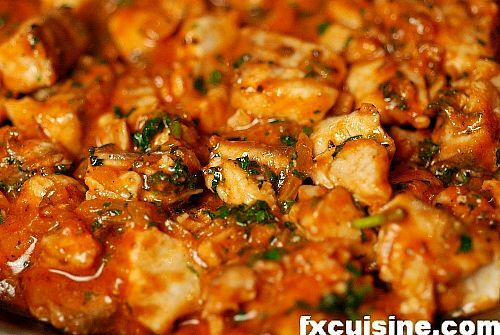 Cook simple Turkish food to the highest order possible. As you arrive, the boss greets you and locate your table on one of the three floors. A waiter comes with a large tray covered with little jars - the mezze. Choose anything you like - roasted peppers, aubergine salad, yogurt or order from the hot starters menu their delicious mussels pilaf and the divine fish börek. 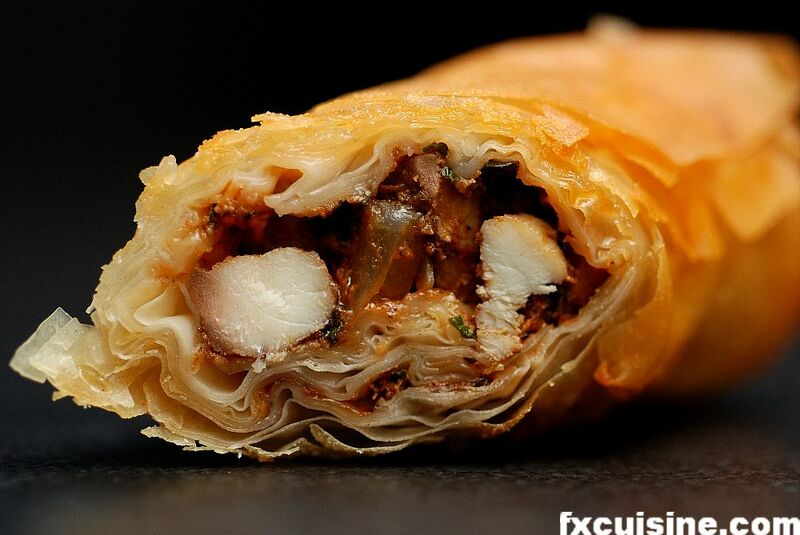 Here is how I managed to make at home one of my three favorite dishes at Balikçi Sabahattin - their gourmet fish börek. Most böreks are deep-fried little cylinders or triangles of filo dough filled (photo) with bad fresh cheese, spinach or meat. But this one had the complexity of a long-simmered Italian crockpot delicacy or of a french braisé. Amazingly fragrant. 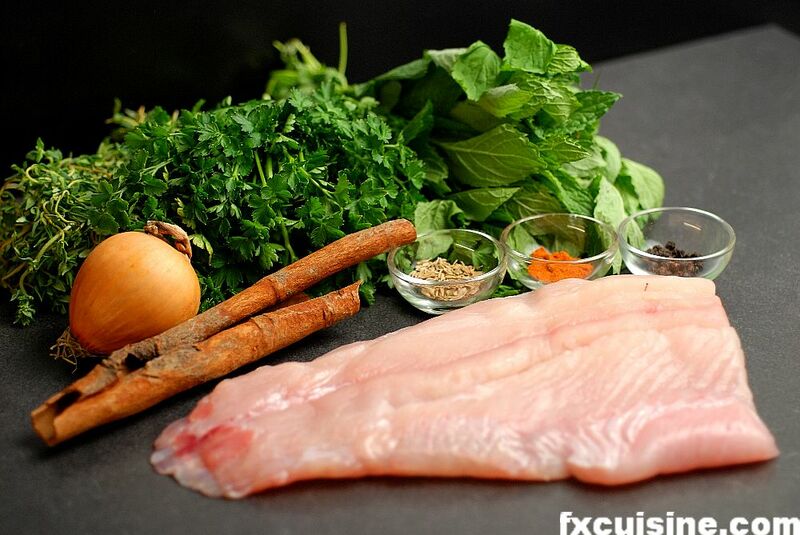 You then choose your fish - red snapper or sea bass will not disappoint you - and wait. The whole neighborhood is bathed in the delicious smell of the fine fishes grilled over hot charcoal at Balikçi Sabahattin, but they grill one fish after the other, so it can take some time. But my friend, it is well worth the wait. Despite the utter simplicity of the dish, it really takes a restaurateur at the top of his art to deliver consistently perfect fish grilled in this way. And don't miss the desserts - that's your opportunity to give traditional Turkish cuisine its fair chance. So often you get a bland mixture of fat, sugar and some starch in Turkey, but here the gloriously rich simmered quinces will carry you to new heights. 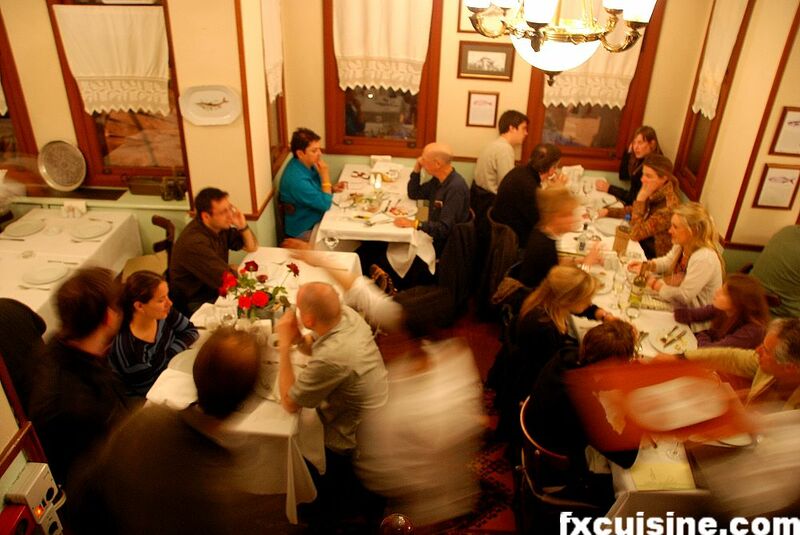 Some people assume that asking a restaurant for a recipe will have you meet a brutish fate. I don't think that's true. Restaurateurs and chefs are often flattered that a patron liked a dish enough to want to make it at home. 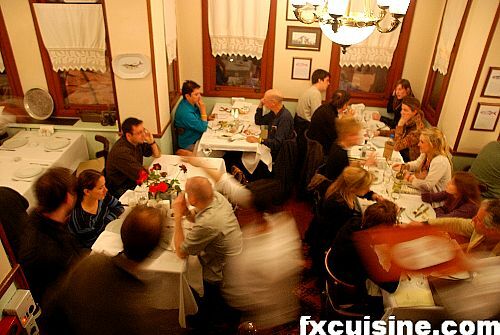 They like it when somebody notice all the care and flair they bestowed on an appetizer most clients will gobble down in a second while talking on their cellphone. And chefs just don't meet their clients that often. I managed to ask the courteous but overworked waiter if he could spare a minute and get me recipe. The third time around, he came back with a three-ingredients-list. 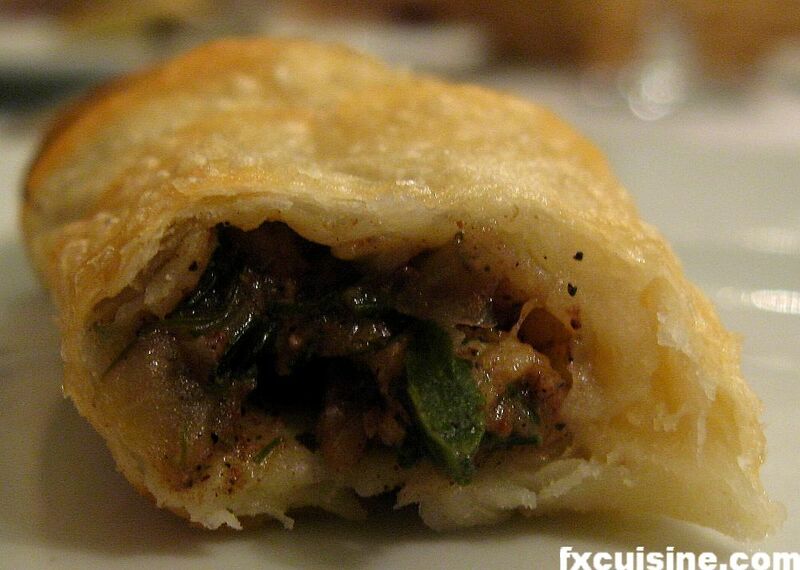 I don't speak Turkish, but there were certainly more than three ingredients in this börek. So I asked the boss, who kindly jotted down 7 ingredients on a piece of paper 'I wrote them in Turkish - you'll have to forgive me'. I thanked profusely and tipped as generously as ever and came back home. 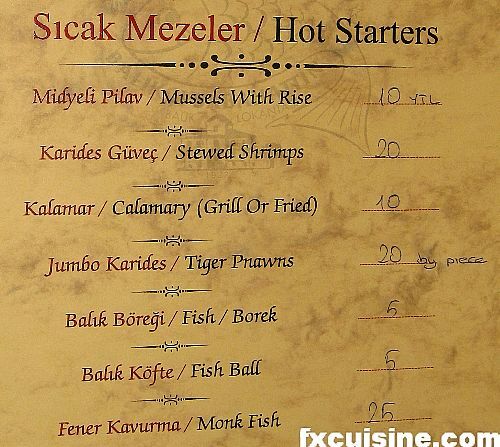 To get the procedure right, I asked a Turkish friend to call the restaurant up and ask the chef how the ingredients came together. The only thing I didn't get were the quantities, but they are easy to assess as you make it. *The original recipe calls for fresh pelamid or anchovy fillets but I used with excellent result the freshest catfish money can buy on Lake Geneva. 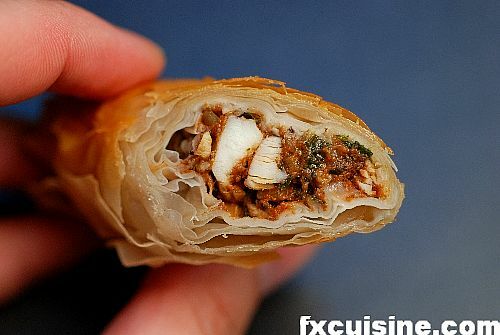 I bought frozen filo dough but a real he-man Turkish chef would do it himself, with undoubtedly better results. 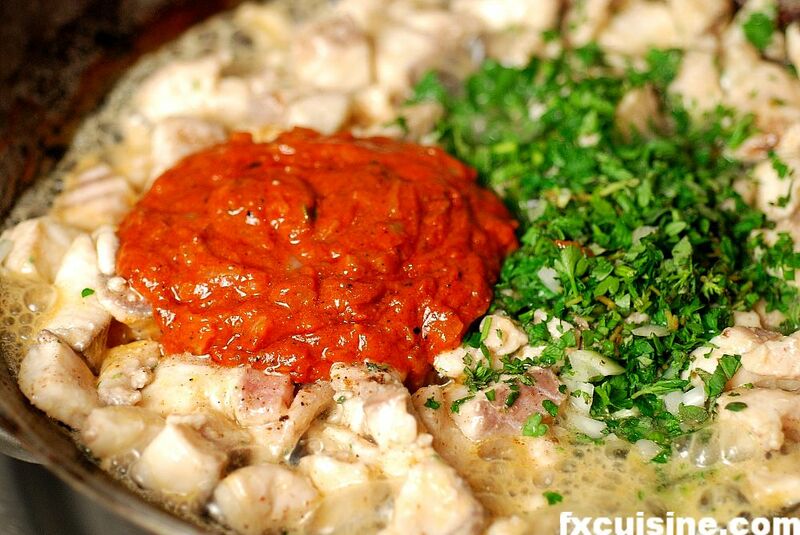 The chef at Balikçi Sabahattin recommends using fresh tomatoes. 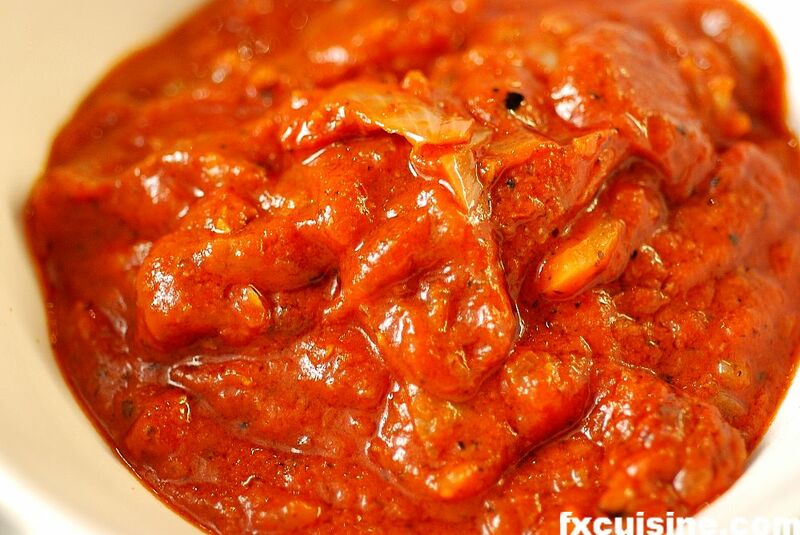 You can substitute isot biber with your favorite chili flakes but it won't be the same. 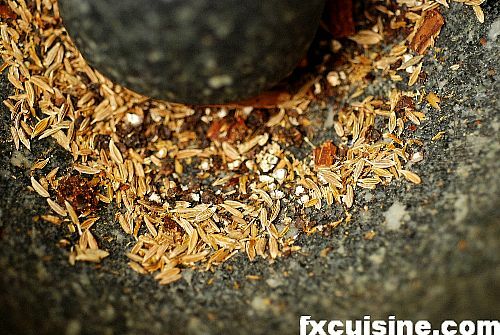 In a mortar or spice mill, crush the spices until you obtain a fine powder. 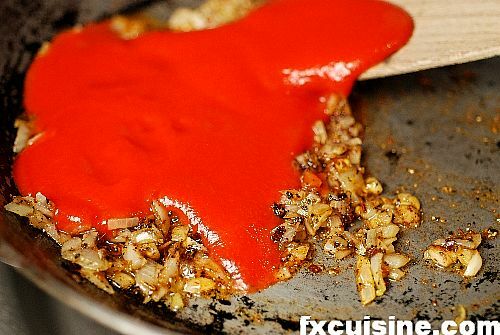 Fry the chopped onion in a little oil. 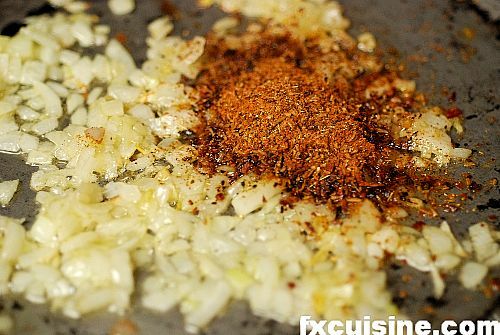 When soft, add the spices and mix well. Cook one more minute. 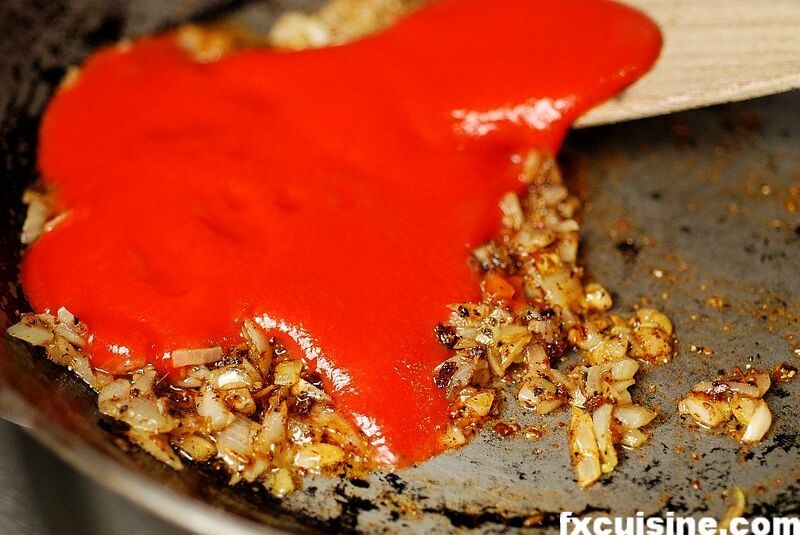 Mix in the tomato and cook for 5 more minutes. Taste and correct the seasoning. 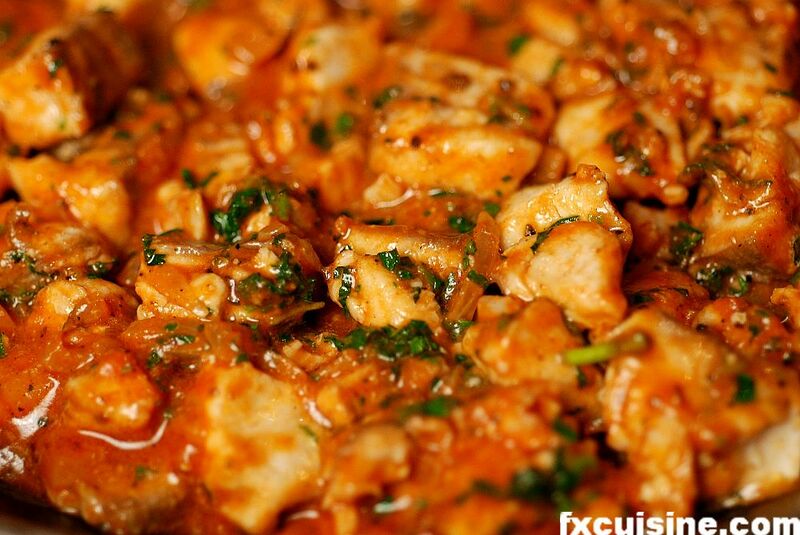 Set aside this sauce while you prepare the fish. 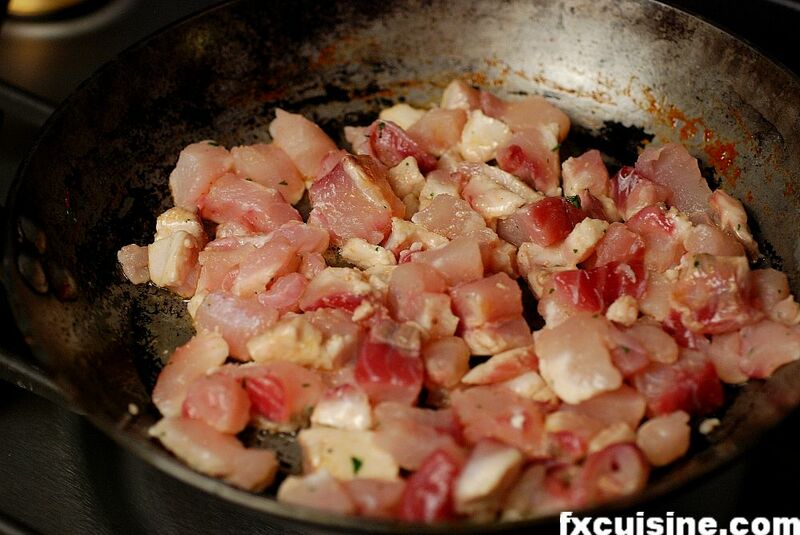 Gently fry the fish cut in almond-sized chunks in a little oil until it turns white and is cooked through (photo). 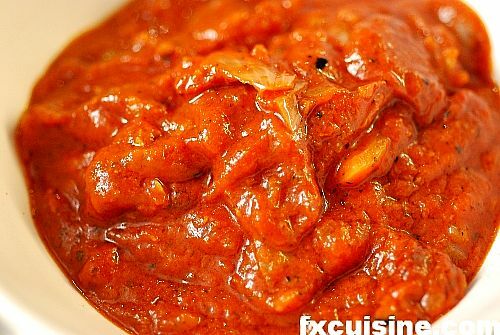 Mix in the finely chopped fresh herbs and fragrant tomato sauce. Mix well and set the filling aside. Carefully lay a half sheet of filo dough on the table and put a generous tablespoon of fish filling at the bottom as on the picture. Fold over (photo) and start rolling. 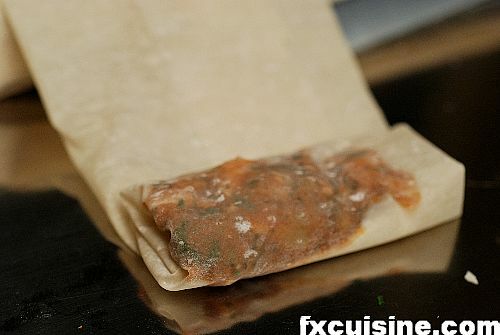 Seal by rubbing a finger dipped in water and pressing the filo dough so that it sticks (photo). Proceed until you run out of filo dough or filling and set your böreks aside while you prepare the deep fryer. Fry until golden brown and crispy in medium-hot oil. 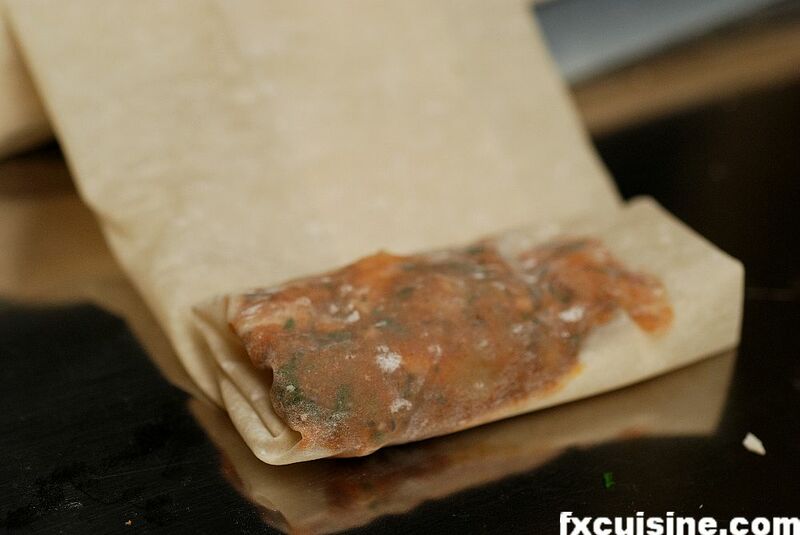 Let the excess oil dripp off the böreks and place on a double layer of absorbing paper (photo). The böreks are incredibly crispy and the filling very fragrant. 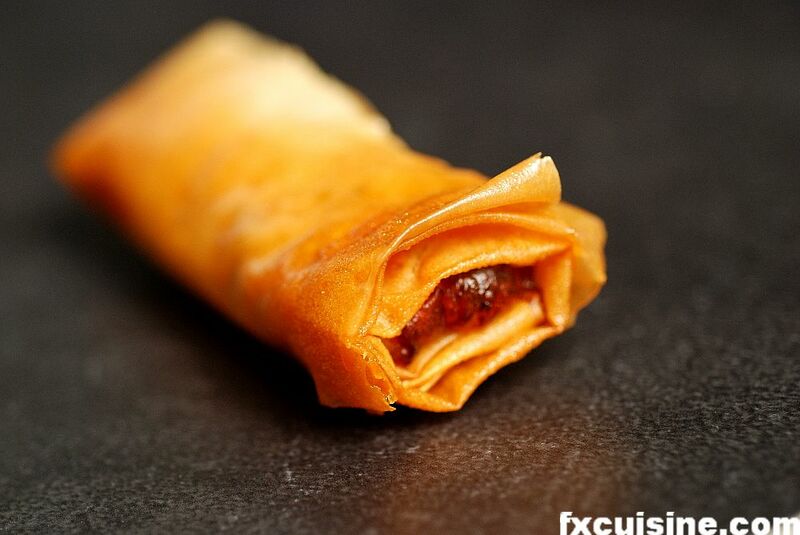 It is highly unlikely any of your guests will ever have tasted böreks with such a delicate filling. Serve hot as an appetizer. I will certainly make this dish again! I added the tomatoes to the ingredient list - thanks! 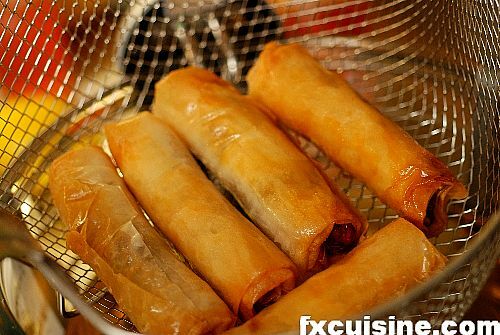 I really don't think you can bake this dish and get an appealing result, unless you sprinkle some oil on the filo dough. But try with one and keep a pot of boiling oil just in case it doesn't work. More more more recipes please, or at least where can I find some really good turkish recipes. Yildiz, I will try to post other Turkish recipes. SUPERB; VERY HELPFULL I CAN'T WAIT TO TRY SOME. Hello, I made these last night and they far exceeded my expectations. Divine! I adjusted the ingredients as I saw fit and used swordfish. 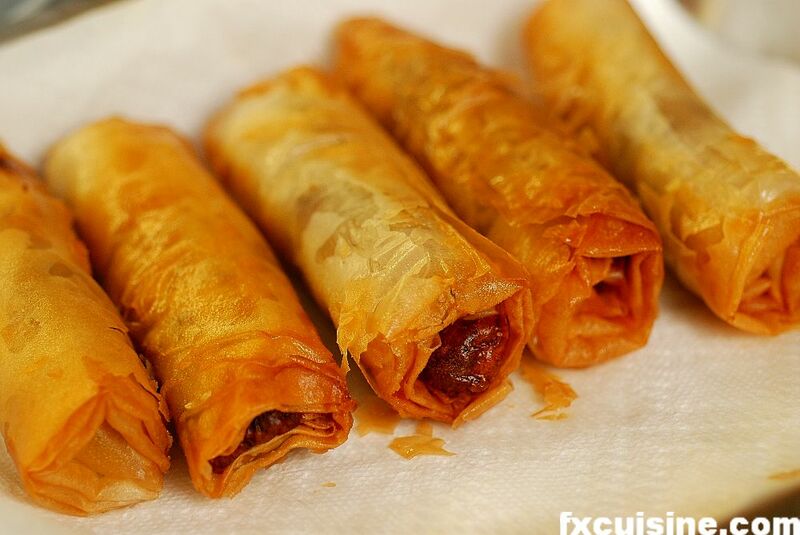 The phyllo dough was not hard to work with, and these were relatively simple to make. I will definitely be making these for my next cocktail party. More Turkish recipes please!!! Mercedes, thanks for trying this and I'm so glad it was a success! I just posted another Turkish recipe, the Pink Leg of Lamb, have a look. The picture looks divine...however... the recipe is missing from this site! Can I possibly get ahold of it...please? 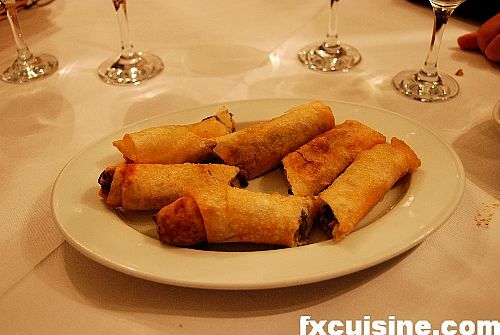 CheshireCat, FXcuisine.com caught the Chinese flu yesterday but now all articles are back online! Dear Fx, What quantities do you use for the herbs and spices? Thank you for your beautiful site. Chris, I got the recipe on the phone through a Turkish-speaking friend and don't have precise quantities for the spices, but I will check my notes if I can find better details. Recently I had dinner at this restaurant, the food was still great but the ambiance had turned into a tourist trap. Much better to do this at home! Hi FX! I'm also curious about the quantity of herbs and spices. Forget the notes, how much do *you* use? We trust you! FX's answer→ Alex, I recommend you try with a pinch of each, taste, and then add more as you go. This is how chefs work in most countries and it is a great way to develop your awareness of the effect of each spice on the overall balance of flavors. 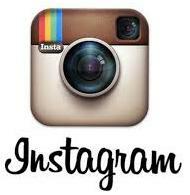 It is easy, and enjoyable! Thanks for your replies, Francois. 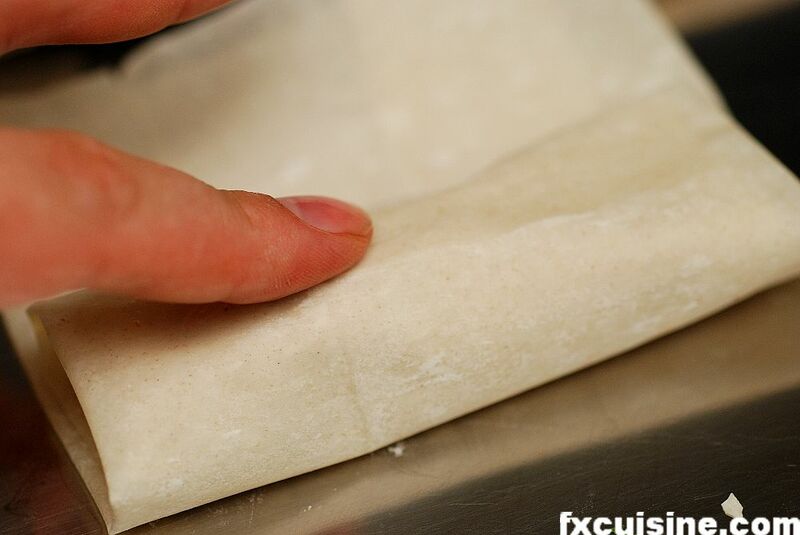 Up until recently I have focused on bread making (it's been several years since I last ate store-bought bread), so for me your blog is a wonderful way to start exploring all the other fascinating areas of pastry and cooking--it's such a joy! 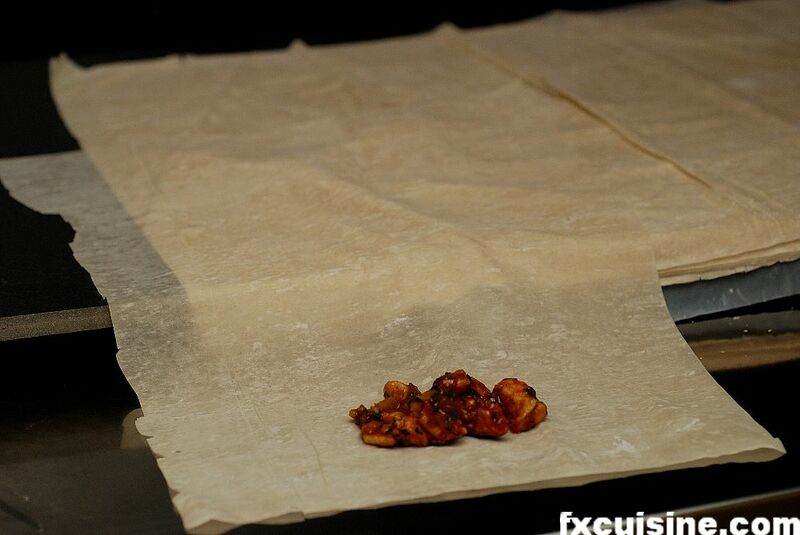 FX's answer→ Alex, in what sort of oven do you bake your bread? What sort of flours do you use? 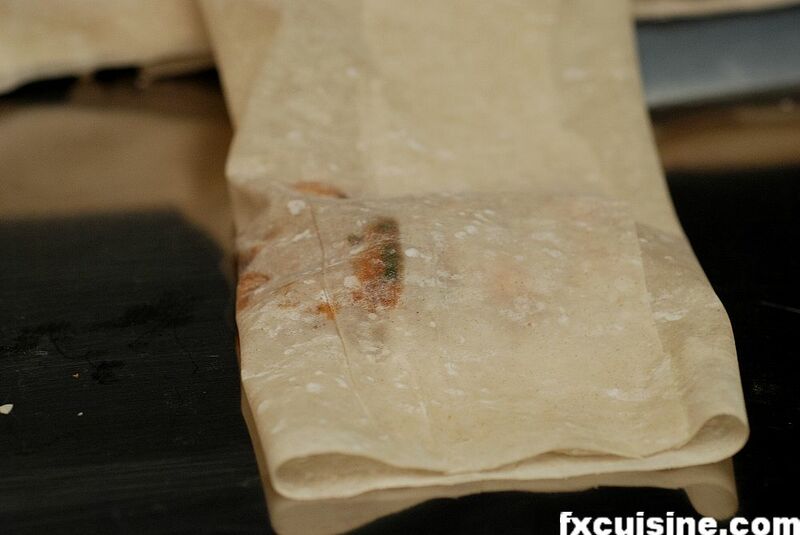 Do you ever mill your own flour? I do make my own flour sometimes, but I prefer to buy it at a small store where they mill it themselves. My favorite breads to make are Russian rye breads (I am from Russia originally). The Russian bread making tradition is so fascinating, I just love scouring books and the Internet for ideas! If you are interested, I can probably translate a couple of my recipes for you to try. FX's answer→ I didn't know there were many bakers in Russia, or do people bake at home or in communal ovens? Well, being a Russian expat who hasn't set foot in Russia for about 20 years I'm not too familiar with the current situation of baking there, but communal ovens are pretty common outside of the big cities. What's interesting is that back in Soviet times there was one official standard bread baking book and every bakery across the USSR had to use the exact same formula for each and every bread type. Now those standards aren't enforced anymore, but home bakers still use them to make their favorite breads. 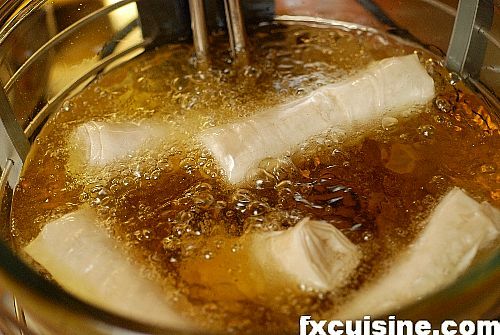 FX's answer→ Oops, soviet-style bread does not sound hugely appealing, but laced with the sweet scent of childhood memories maybe it makes for an appealing thought! LOL, you should try some! 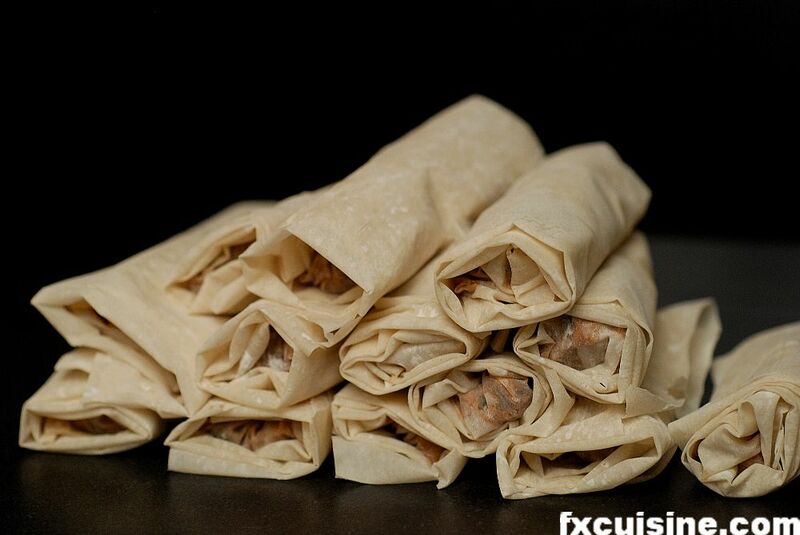 I made these last night and they far exceeded my expectations.thanks for great article. 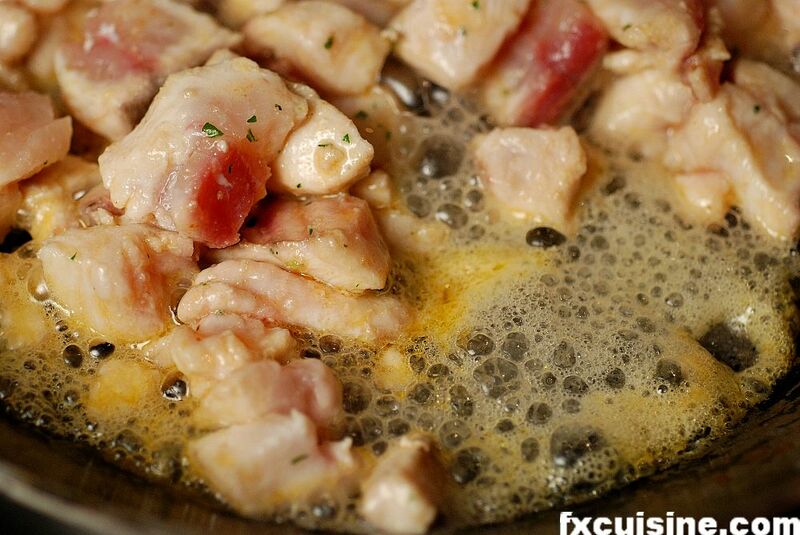 FX's answer→ Thanks, I also really love this recipe!